It can be easy to overlook the monstrous scale of the Antarctic ice sheet. Ice, thick enough in many places to bury mountains, covers a continent roughly the size of the US and Mexico combined. If it were all to melt, as it has in the past, global sea levels would rise by 58 metres. While this scenario is unlikely, Antarctica is so massive that just a small fraction of this ice melting would be enough to displace hundreds of millions of people who live by the coast. Low-lying cities face the threat of flooding when extreme weather coincides with high tides. Although typically rare, these events are already increasing in frequency, and will become commonplace as global sea levels increase. Over the coming decades, rising sea levels from melting ice and the expansion of warming oceans will strain societies and economies worldwide. Improving our understanding of how much Antarctica has contributed to sea level rise in the past, and how much it will contribute in the future, is vital to informing our response to climate change. Achieving this is impossible without satellites. Antarctica is too vast, too remote – satellites are our only means of monitoring its behaviour on a continental scale. Satellites launched by the European Space Agency and NASA allow scientists to monitor changes in ice height, ice velocity and ice mass through changes in Earth's gravity field. Each of these satellites provide an independent way to measure Antarctica's past contribution to sea level rise. The ice sheet mass balance inter-comparison exercise (IMBIE) is an international effort: a team of 84 polar scientists from 44 organisations, including both of us, working together to provide a single, global record of ice loss from Earth's polar ice sheets. In our latest assessment, published in Nature, we used 11 different satellite missions to track Antarctica's sea level contribution since the early 1990s. We have found that since 1992 Antarctica has lost 2,720 billion tonnes of ice, raising global sea levels by 7.6mm. What is most concerning, is that almost half of this ice loss has occurred in the past five years. Antarctica is now causing sea levels to rise at a rate of 0.6mm a year – faster now than at any time in the past 25 years. Most of this ice loss has come from West Antarctica. In the Amundsen Sea Embayment (named after Roald Amundsen, one of the first explorers to reach the South Pole) warming ocean temperatures have reduced the floating ice shelves which slow the flow of the mighty Pine Island and Thwaites Glaciers, resulting in a rapid acceleration of ice losses. Between 1992 and 2017 we have observed a threefold increase in the rate of ice loss from West Antarctica, from 53 to 159 billion tonnes a year. 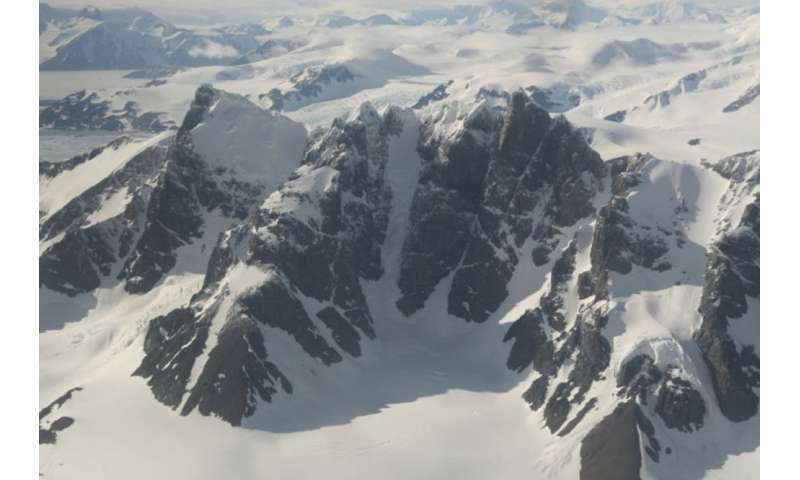 In the Antarctic Peninsula, the collapse of the Larsen B and Wilkins ice shelves in the 2000s has had similar consequences: an abrupt acceleration in the rate local glaciers drain into the ocean. This new knowledge will help us better predict sea level rise in the future. In 2014 the intergovernmental panel on climate change (IPCC) published its fifth assessment report, which includes modelled projections of Antarctica's contribution to sea level rise over the century. 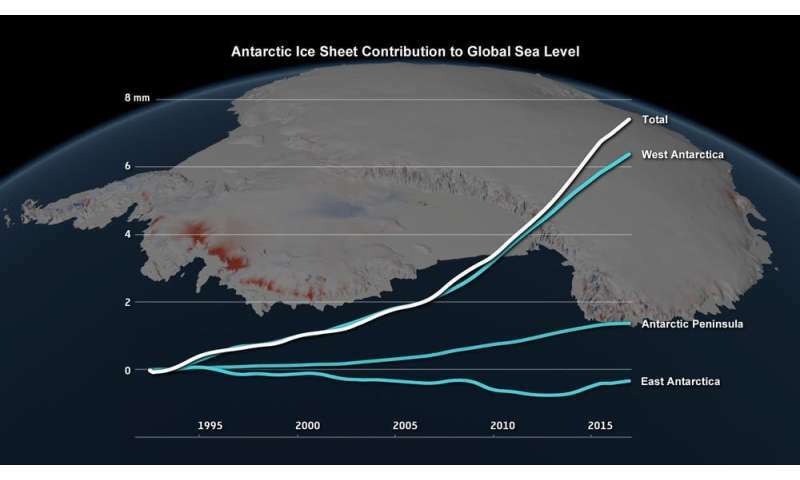 By mapping our measured sea level contribution on top of these projections, we found that our previous assessment of Antarctic sea level contribution, which measured ice loss until 2012, was tracking the IPCC's lowest projection. In light of the acceleration in ice loss we have observed over the past five years, we now find sea level rise from Antarctica to be tracking the IPCC's highest projection. This amounts to an additional 15cm in global sea level rise from Antarctica alone by 2100. 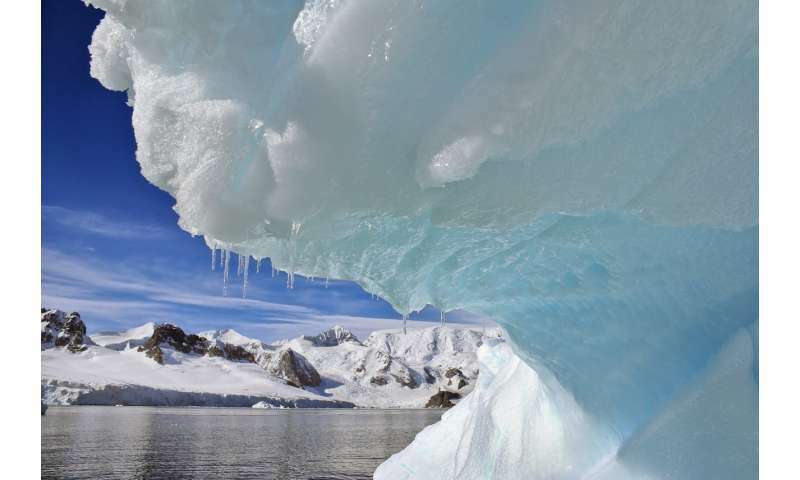 We have long suspected that changes in Earth's climate will affect the polar ice sheets. The rapid increase in Antarctic ice loss and consequent sea level rise we have measured over the past 25 years are a clear indicator of climate change. Limiting global warming to 2℃ by 2100, as set by the Paris Agreement, looks increasingly unlikely. The rate at which ice losses from Antarctica will increase in response to a warming world remains uncertain. It is important, now more than ever, that we continue to use satellites to monitor Antarctica in order to better prepare ourselves for the challenges ahead. This comment has been removed by a moderator. @ZoeBell, why don't you have a Nobel prize? Because if you actually have evidence of dark matter interacting with baryons, and you can both prove that CO2 has nothing to do with global warming AND that your geothermal theory is correct, you're undoubtedly the single most accomplished scientist of all time.